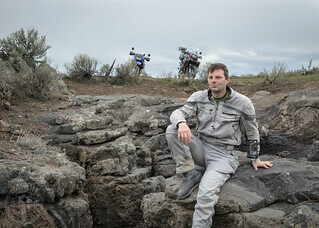 Tyson and I ride our big bikes through the desert from Boise to Juntura, Oregon with a gnarly stop in Dry Creek Gorge. Dinner at the Oasis caps a day that ends with us flying home on the darkened Interstate. Greenhorn Ben joins me for an overnight ride along Hell’s Canyon on our way to North Idaho, me for a high school reunion and Ben to see family. 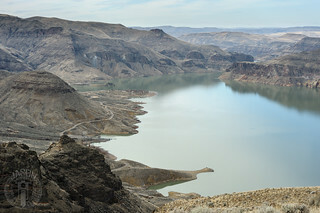 We enjoy a beautiful view of the Seven Devils from our campsite on the lip of the canyon. I meet up with a new rider, Ben, for a ride south across hills arid and unknown to us around Big Jacks Creek and beyond toward Nevada. We explore a homestead and Zeno Falls before struggling to find the route home. 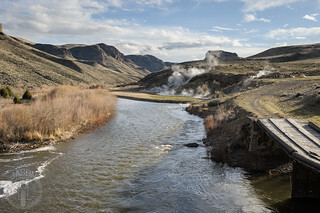 I join Phil, Ryan, Sam and Tyson for a little of Idaho’s Centennial Trail along the Bruneau and an overnight along hot springs. The road into the canyon conspires with morning snow to mean us harm. 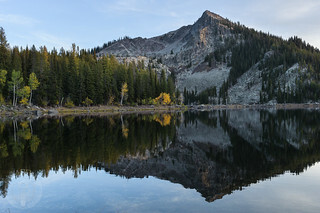 Ryan puts out a late season invitation for a night along the beautiful Louie Lake. 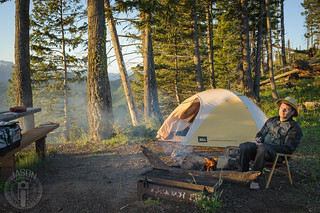 About five of us answer the call to ride a couple hours north and climb the rocky trail to the lake’s edge where we sit around a fire and tell stories of old rides. After a wet and windy night we ride autumn-colored backroads by Yellow Pine to home. Sam leads three of us on a day-ride around the Owhyee Uplands Back Country Byway. We encounter a little weather at the highest altitudes while Toni and Heath on their smaller bikes pursue a more exploratory route. They show up later muddy and disheveled. Jessica and I meet again with some thirty fine members of the Idaho Adventure Motorcycle Club for breakfast at Rockie’s Diner before being led by Sam by Bonneville Point past Mayfield and Skull Rock for lunch in Pine, Idaho. From there we split up to return by different routes. 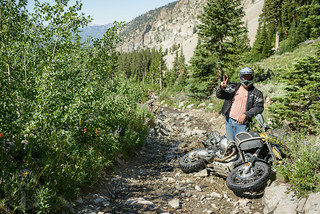 Jessica and I ride together on the GS1200 with a few of the Idaho Motorcycle Club crew to Pilot Peak, Sunset Mountain summit and Jackson Peak, then we take off on our own for a little exploration, discovering one of the rare Idaho Moai. Jessica and I ride together with a club we just learned about up Blacks Creek to the Y-Stop, over to Arrowrock then up to Thorn Creek Butte before an ice cream stop (thanks Sam) in Idaho City. I join Ely from work and a couple of his riding buddies for a dirt loop around the Boise Ridge. A few obstacles along the way ensure entertainment.